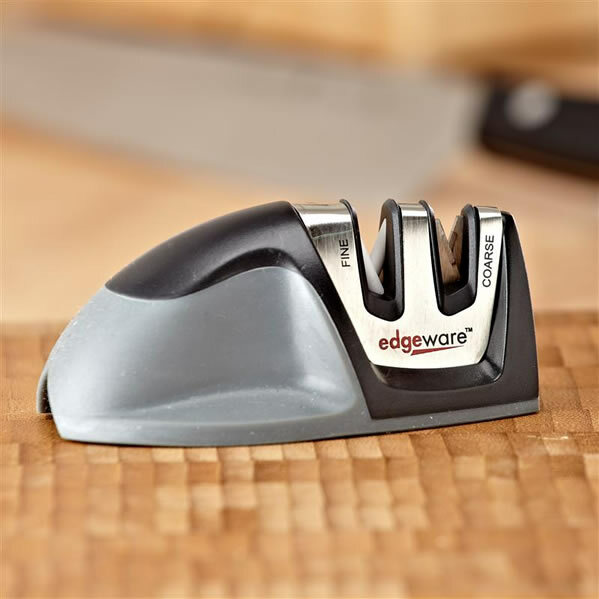 The Edge GripT 2-Stage Knife Sharpener is lightweight, portable, and easy to use on either a flat surface or the edge of your countertop or table. Carbide blades and crossed ceramic rods feature pre-set sharpening angles that provide the proper sharpening angle every time. Carbide blades (Coarse) provide quick edge setting capabilities, and the ceramic rods (Fine) are used for the final edge honing. These two stages offer the capability to put a razor sharp edge on very dull or damaged blade and touch up already sharp blades. 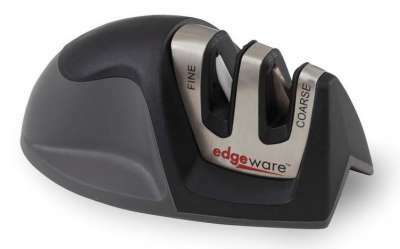 It comes with non-slip rubber feet and a soft grip rubber handle for comfort and steadiness when sharpening. 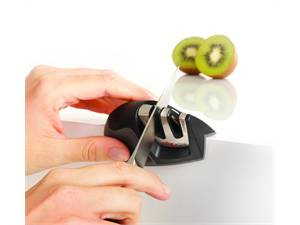 The patented V-GripT bottom allows for added stability and comfort when using the sharpener on the edge of your countertop or table.